<snip> For me,who will not be around to see it, I really hope that the kilt wearers of the future, with distant, or non Scots connections, will move on to new tartans and leave the clan tartans to the Scots. So I did some research about other Canadian tartans and there are a ton of them! All of the provinces/territories have tartans (most of them official), there are university tartans, city tartans, military/police tartans, and even a tartan for the lone, Canadian, major league baseball team. Many of these come in several different versions and there are also alternative unofficial iterations. I'm going to post a whole bunch of images of these various tartans as a resource for my fellow Canucks (or anyone else) interested in them. I'll try to make each image clickable as a link to a page with info about the tartan. I'd also love to see pictures from the rabble who have kilts in any of them, so please post! - Unfortunately, not all of these tartans are readily available and custom weaves can be prohibitively expensive... who has sources for kilts in any of these tartans? - What is your favourite Canadian tartan? - If you don't have kilt in a Canadian tartan, would you wear one? Why or why not? I think that it's ironic that the Maple Leaf is probably the most popular and recognizable Canadian tartan but is not officially recognized as the national tartan. Burnett's and Struth organized a lovely tartan for our newest territory (1999), Nunavut but it is not official (yet?). I think I like the Maple Leaf and the Ensign of Ontario is nice, but the Yukon Tartan stands out and reminds me of my time up there six autumns ago. The digital image of Maple Leaf that you posted just does not do it justice. Here is my Canadian Casual Kilts Maple Leaf with my L&M beaver dress sporran (please note gold maple leaves on cantle). A frustrating search for even an image of the OOT always seems to turn up Ensign of Ontario which goes to show how incorrect information is taken as correct on the interweb. How do I know this? Because 5 months ago I put an Order in with Slohairt - Keltoi Celtic Clothing for a kilt in the Official Ontario tartan. A search by John found the last 8 yards of Ensign of Ontario that Burnett's and Struth had in stock but none of the OOT. An order for custom weave from D.C. Dalgliesh and several months later the material has finally arrived in Canada. Should make for a unique kilt with the trouble in getting the tartan. We at XMarks had a discussion already on Ontario tartans (I believe the pics have since disappeared which is unfortunate. When I have my kilt I'll be sure to post pictures here. Thanks for posting your CCK Maple Leaf, it's very helpful to see actual fabric. 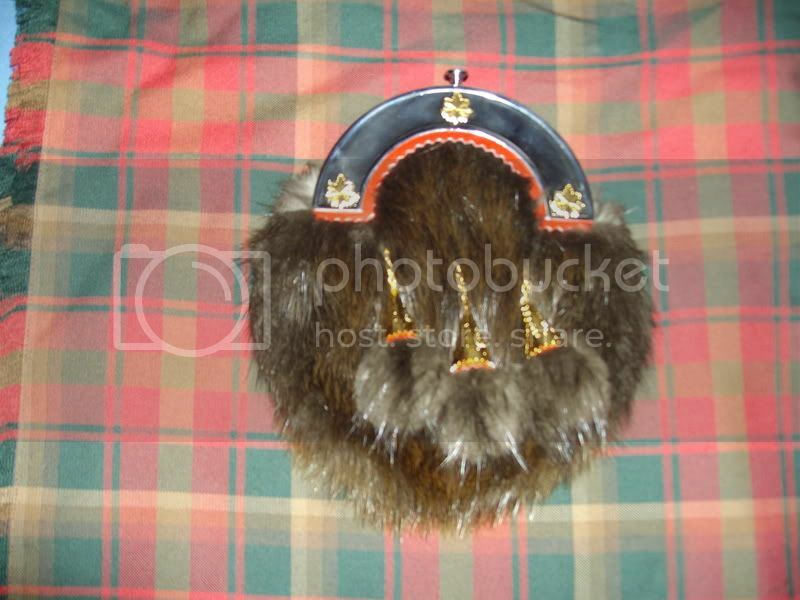 I'll keep posting the digital renderings form the Scottish Register of Tartans, but just as a reference. Hopefully other people will have photos of Canadian tartan kilts to share! That's about it. Rather than make the Ensign the official tartan someone designed the new one and had it recognized bt the Tartan Act 2000. Note the description; "In the tartan, the shades of green represent the forests and fields of Ontario, the red represents the First Nations of Ontario, the shades of blue represent the waters of Ontario and the white represents the sky over Ontario." Must've been a cloudy day when the designer sat down with paper and pencil crayons! I'll admit I was torn over the two tartans and inspite of the additional cost of the custom weave I chose the official because of the symbolism of the blue for the lakes. I've spent the last ten years activly involved in the Coast Guard Auxiliary on the west end of Lake Ontario, so for me it had greater personal meaning. Surprisingly the Maple leaf is not our official national tartan, we don't have one. It is, thankfully, the official tartan of the Royal Canadian Regiment. Alright then you proud Canadians help me out here. On the tartan maple leaf that is shown on the first post here, there is a "Loud MacLeod"(at about the 10 o'clock position) type tartan, what does that signify? Is there a full picture of it? Thank you.